This dissertation presents an experimental and numerical consideration of fluid instabilities formed by the interaction of a planar shock wave and a cylindrical column of gas seeded with glycol droplets. Seeding a fluid flow with a passive tracer is a common practice in experimental fluids research and it is important to understand how these tracers behave. It will be shown that these tracers do not explicitly follow the flow, and in extreme cases can cause hydrodynamic instabilities. 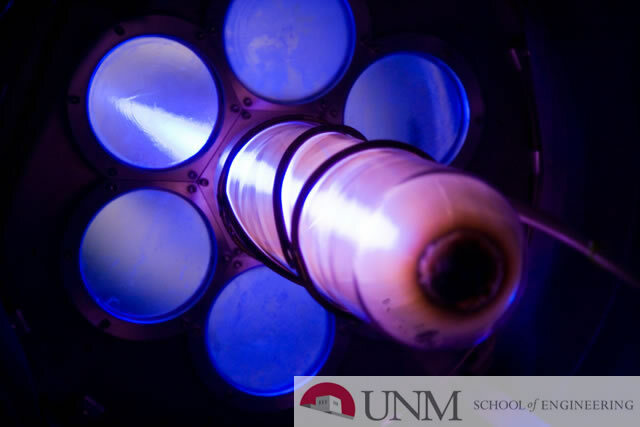 Experiments were performed in the University of New Mexico (UNM) tiltable shock tube facility and numerical analysis was performed using the Eulerian hydrodynamics code SHAMRC (Second-order Hydrodynamic Automatic Mesh Refinement Code). Two gases are considered. The first gas is sulfur hexafluoride (SF6), which generates the well known Richtmyer-Meshkov Instability (RMI) when accelerated by a shock wave. This instability is formed due to a mis-alignment of the pressure and density gradients during impulsive acceleration. The second gas is air. There is no density gradient between the gas column and the surrounding air, but an instability is formed that is similar in morphology to RMI due to the presence of the glycol droplets. Experimental and numerical results are presented for both types of instability at Mach numbers 1.2, 1.67, and 2.0. Also, numerical parameter studies that vary the Atwood number, Mach number, and the droplet diameter are discussed. The cylindrical gas column represents a three-dimensional set of initial conditions which are often considered two-dimensional due to geometry. The validity of this assumption is explored experimentally and numerically for both types of initial conditions by looking at images taken (or produced) in both horizontal and vertical planes of the instability. The results show that this assumption is valid, with variations in the instabilities morphology occurring only near the walls of the shock tube. Finally, a fully 3D scenario is considered by introducing an angle of incidence between the planar shock wave and the cylindrical column. Turbulence, Shock waves, Multiphase flow, Computational fluid dynamics.